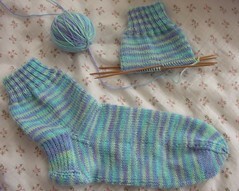 Nicole's Needlework: I actually finished a sock! I actually finished a sock! I got this sock finished Saturday night and cast on right away for the second one. I'm determined to get these finished! I knitted a lot yesterday on the way to see my MIL - just a little more and I'll be ready to start the heel. Riley is fussing too at the moment and up a lot again in the night when he was sleeping through. So like you, I'm hoping it's just a phase too. I'm behind a little bit and had to read the last couple of your posts. I feel the same way you do about stash - I'd rather just cut back a little - but I won't give it up completely. Those guidelines are too rigid. And we don't want to put the needlework shops out of busy, do we? LOL! Congrats on the finished sock, it looks great.